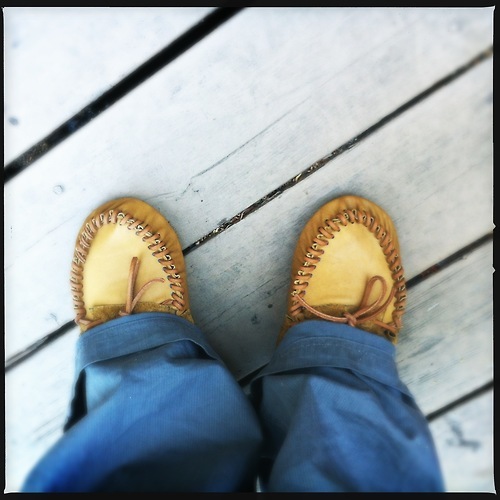 The most comfortable shoes I ever owned were a pair of tall buckskin moccasins I had when I was a kid. I would even wear them in winter. With a pair of wool socks, they were better than clunky snow boots. This evening I finished making a pair of basic moccasins to use this winter as house shoes at our cabin. The outer is oiled leather bound with heavy lace. The insole is a thick 8 oz. piece of leather. They are quite comfy. p.s. Sorry I haven’t posted in a while. I’ve been spending all my blogging time on Tumblr. There will be more activity this winter, I promise.